On Monday, 5 June 2017, the Seattle City Council introduced an amendment to the Council’s referral calendar to have $2.3m in Families and Education Levy funds earmarked as one-time bridge funding for school buses. If funded these funds direct will go to Seattle Public Schools to pay for school buses allowing the district to shift to a two-tier start time versus the current three-tiers next school year. The Families and Education Levy is overseen by the Levy Oversight Committee (LOC). The LOC voted 4 opposed, 3 in favor to fund the request. Erin Okuno, Executive Director of SESEC, was one of the members opposed. SESEC is also opposed to using levy funds to pay for buses and has shared these views with the City Council. We are not opposed to shifting to a two-tier start time if other appropriate and sustainable funding source could be found. Divesting funds originally dedicated to supporting students of color and shifting them to a race neutral strategy allows institutional racism to happen. Funding buses across the school district is equality (giving all students the same), not racial equity. Decision making for racial equity requires us, especially policy makers, to slow down and engage with communities, families, and students of color. Communities of color were not asked how they would we like to see $2.3-million in levy funds used to close persistent and damaging racialized opportunity and achievement gaps. We question the use of levy funding on paying for buses when transportation has traditionally been part of basic education formula paid for by the state. Levy funding is meant to supplement, not supplant basic education dollars. While we understand many community members are asking for this to be funded, we are taking a principled stand on saying we oppose using levy dollars for this item. Section 6. Education-Support Services. 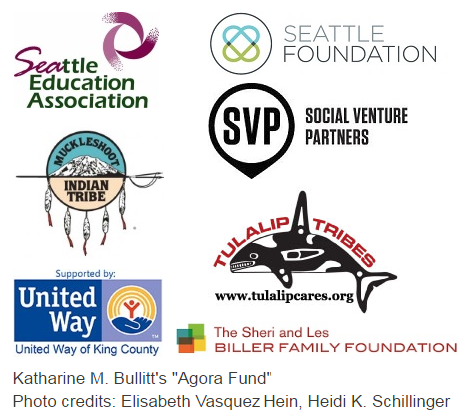 Education-Support Services funded by Proceeds are intended to promote school readiness and learning, support academic achievement and reduce the academic achievement gap, and prepare graduates for college and the career of their choice. 8. Invest in family strengthening practices. We are opposed to using Families and Education levy funds to pay for school buses. We are not opposed to moving school bell-times to two-tiers if other appropriate ongoing funding sources are found. Diverting levy funds away from their original intent of closing opportunity and achievement gaps is how institutional racism happens. Funding buses across the school district is a race neutral equality strategy. It is not a targeted strategy at closing racialized opportunity and achievement gaps. Paying for buses will not achieve the deeply needed focus on racial equity. While many are asking to move to a two-tier start and end time, it shouldn’t come out of levy dollars. The opportunity cost of using these funds for this and not a targeted strategy is an important consideration. Should other sustainable and appropriate funding sources be found to pay for this, we welcome those funds. We are asking you to govern for racial equity and stay true to the intent of the Families and Education Levy.